If you know you have a good chance of getting matched this year, then get all your extra certifications out of the way if you have time. You should have your Basic Life Support (BLS) initially done, or combined with an advanced one listed below. You may not have to get all of the ones listed for your residency program, but the most important one out of the list, is the ACLS. You can find information from where to go from the American Heart Association site. 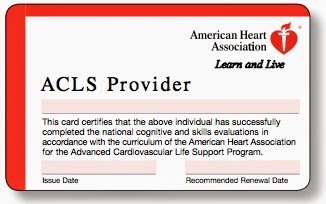 When you get your ACLS certification, be prepared to get your Step 2 CK ER cardiac knowledge tested. A lot of ACLS test questions are out of the MTB2 book from the ER section. They test you on the ECGs a lot; they test you to identify between Atrial Fibrillation, Atrial Flutter, Ventricular Fibrillation, Ventricular Tachycardia, Supraventricular Tachycardia, Asystole, and some other crazy ECG patters which I never saw before. They also test you on which drugs to use in an emergency situation, the most important drug to remember to use is epinephrine and vasopressin in cardiac arrest patient. They also test you on management of patients in emergency situations. You need 80% or above to pass, which should be no problem if you studied for Step 2 CK. There are 60 test questions total and after you are done, you can watch videos before being tested in person in front of a teacher. It costs around $150-$200 for the ACLS certification and it is good for two years. ACLS certification checkbox is also presented in your ERAS presentation, which may boost your application for residency.